Legendary Wood River High School athletic coach Bob Shay liked most things about track and field, but he particularly enjoyed distance running. That's not surprising for a coach who enjoyed training with his runners and led Wood River teams to five Idaho cross country championships. Coach Shay would have smiled broadly at the efforts of Wood River distance runners during Thursday's Bob Shay Memorial Invitational high school track meet at Hailey's Phil Homer Field. 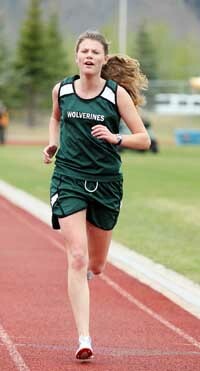 Wood River athletes swept the six distance races—seniors Ben Stout and Corrine Smith winning the 800-meter and 1600m races, junior Chase England taking the boys' 3200m and sophomore Haley Montgomery chalking up a sixth Wolverine gold medal in the girls' 3200m. Putting it all together, the Wolverine boys amassed 56 of their fourth-place 57 points in the distances, while the more balanced Wood River girls obtained 61 of their third-place 107 points in the longer runs. Stout had a couple of dandy races fighting off the challenges of Burley senior Parley Pickett. In the 800m, Stout improved his winning time compared to last year's Shay Invitational victory by over two seconds and out-legged Pickett by 4.50 seconds. In the 1600m, Stout finally managed to outlast Pickett in the final 125 meters, winning by 4.30 seconds. Corrine Smith was just as good. She defended her Shay titles, clipping four seconds off her 800m winning time from last May, and improving by 13 seconds in the 1600m to breeze to a nearly 17-second win. Also coming a long way was England, who won the 3200m by 33 seconds and was 30 seconds faster than his two-mile time from last May. England placed third in the 1600m with a personal-best time. Montgomery was the wire-to-wire winner in the girls' 3200m with a 21-second triumph. On a day chocked full of changeable mountain weather and rain that canceled girls' shotput, Wolverine senior Cheyenne Swanson settled for second in her signature event, the discus. Her throw was 113-8. Sophomore Janel Passey showed some strong running with second places in the 400m and 3200m, two events that rarely go together. Junior Nicole Pratt, a reliable performer for retiring girls' coach J.C. Nemecek for three seasons, was second in 300m intermediate hurdles in a personal-best time. Another promising sophomore, Nate Thomas, was second at 3200m in a personal-best. Freshman Kenya Schott placed third in the 400m, again a personal best, while senior Jade Atkinson was third in the 1600m (PR) and 3200m. The Hailey girls' 4x400m relay of Pratt, Schott, Dani McLaughlin and Smith captured third place. Known for their sprinters and relay teams, the Canyon Ridge Riverhawks (15 golds on the day) won the six-school boys' meet 215-134 over Minico and added the girls' title 183-120 over Minico. Stadium long jump record holder Kayla Lee of Canyon Ridge, a junior, piled up 32.5 points herself by winning the 200m, long and triple jump and anchoring the Riverhawks winning 4x200m relay. The 'Hawks boys took three relays and got two hurdles wins by senior Kable Barnhart. Next up: The state-qualifying Great Basin Conference 4th District 4A meet is today, Wednesday and Thursday, May 9-10 at Burley High School. Competing will be athletes from Wood River, Twin Falls, Canyon Ridge, Minico, Jerome and Burley. Qualifying for the United Dairymen of Idaho's 95th annual State Track and Field Championships at Middleton High School May 18-19 will be the top three individuals and top two relay teams from the conference meet. Teams: 1—Canyon Ridge of Twin Falls 215 points (55 sprints, 39 hurdles, 11 distances, 36 relays, 74 field). 2—Minico of Rupert 134 (23 sprints, 12 hurdles, 1 distances, 30 relays, 68 field). 3—Burley 100. 4—Wood River 57 (0 sprints, 0 hurdles, 56 distances, 0 relays, 1 field). 5—Mackay 13. 6—Buhl 6. 100m: 1—Bobby Rios (CR) 11.10 seconds. 200m: 1—Jake Packham (CR) 23.65. 400m: 1—Michael Sunderland (M) 51.61. 800m: 1—Ben Stout (WR) 2:01.50. 5—Alexis Gonzalez (WR) 2:16.00 (PR). 1600m: 1—Ben Stout (WR) 4:36.90. 3—Chase England (WR) 4:51.50 (PR). 4—Alexis Gonzalez (WR) 5:07.00. 5—Nate Thomas (WR) 5:07.31 (PR). 7—Herberto Mendoza (WR) 5:34.18. 8—Desmond Porth (WR) 5:38.59 (PR). 3200m: 1—Chase England (WR) 10:16.00. 2—Nate Thomas (WR) 10:49.00 (PR). 4—Alexis Gonzalez (WR) 11:05.00. 7—Desmond Porth (WR) 12:07.00 (PR). 8—Herberto Mendoza (WR) 12:08.00 (PR). 110m high hurdles: 1—Kable Barnhart (CR) 16.10. 300m intermediate hurdles: 1—Kable Barnhart (CR) 45.50. High jump: 1—Dallin Griffin (M) 6-0. Long jump: 1—Ammon Clapier (M) 18-11. 9—Josh King (WR) 16-10. Triple jump: 1—Jake Garn (Burley) 39-7. Pole vault: 1—Callin Christensen (Burley) 13-3. Shotput: 1—Cameran Bartlett (CR) 46-1. Discus: 1—Jonathan Valero (M) 150-11. 4x100m relay: 1—Canyon Ridge (Cameran Bartlett, Bobby Rios, Braydon Metcalf, Nick Kytle) 46.50. 4x200m relay: 1—Canyon Ridge (Cameran Bartlett, Nick Kytle, Jake Packham, Nathan Sterner) 1:35.00. Sprint medley relay (200, 200, 400, 800): 1—Canyon Ridge (Beau Dunford, Bobby Rios, Eric Navarette, Leo Campos) 4:08.57. 4x400m relay: 1—Minico (Ammon Clapier, Michael Sunderland, Dallin Griffin, Caleb Worley) 3:30.88. Teams: 1—Canyon Ridge 183 points (50 sprints, 33 hurdles, 16 distances, 30 relays, 54 field). 2—Minico (16 sprints, 10 hurdles, 4 distances, 36 relays, 54 field). 3—Wood River 107 (18 sprints, 12 hurdles, 61 distances, 6 relays, 10 field). 4—Mackay 42. 5—Burley 20. 6—Jerome 10. 7—Butte County 6. 100m: 1—Kailee May (M) 12.80. 200m: 1—Kayla Lee (CR) 27.10. 4—Nicole Pratt (WR) 30.30. 7—Emilia Bingham (WR) 31.22. 400m: 1—Ellie Packham (CR) 1:04.07. 2—Janel Passey (WR) 1:05.51. 3—Kenya Schott (WR) 1:09.08 (PR). 800m: 1—Corrine Smith (WR) 2:37.00. 4—Kenya Schott (WR) 2:44.99. 5—Telar McClure (WR) 2:49.00. 7—Dani McLaughlin (WR) 2:54.00. 1600m: 1—Corrine Smith (WR) 6:01.21. 3—Jade Atkinson (WR) 6:20.90 (PR). 6—Telar McClure (WR) 6:27.00 (PR). 7—Dani McLaughlin (WR) 6:28.00. 3200m: 1—Haley Montgomery (WR) 13:18.01. 2—Janel Passey (WR) 13:39.57 (PR). 3—Jade Atkinson (WR) 13:47.86. 4—Dani McLaughlin (WR) 13:55.65. 100m high hurdles: 1—Rebecca Child (M) 16.20. 4—Emilia Bingham (WR) 18.73. 300m intermediate hurdles: 1—Cierra Ehlers (CR) 52.80. 2—Nicole Pratt (WR) 54.50 (PR). High jump: 1—Sydney Meier (M) 5-2. Long jump: 1—Kayla Lee (CR) 16-5. Triple jump: 1—Kayla Lee (CR) 35-1.5. 5—Nicole Pratt (WR) 29-5. Pole vault: 1—Kylee Denney (CR) 9-9. Shotput: Not contested. Discus: 1—Linsey Bair (M) 117-8. 2—Cheyenne Swanson (WR) 113-8. 4x100m relay: 1—Minico 52.30. 4x200m relay: 1—Canyon Ridge (Victoria Jones, Kelsi King, Ellie Packham, Kayla Lee) 1:49.40. Sprint medley relay (100, 100, 200, 400): 1—Minico (Chloe Bradford, Melissa Lowery, Ana Tellez, Chayo Tellez) 2:02.10. 4x400m relay: 1—Jerome (Jasmine Branch, Mackenzie Martens, Jordan Morgensen, Ashley Cox) 4:09.20. 3—Wood River (Nicole Pratt, Kenya Schott, Dani McLaughlin, Corrine Smith) 4:43.10 (PR).